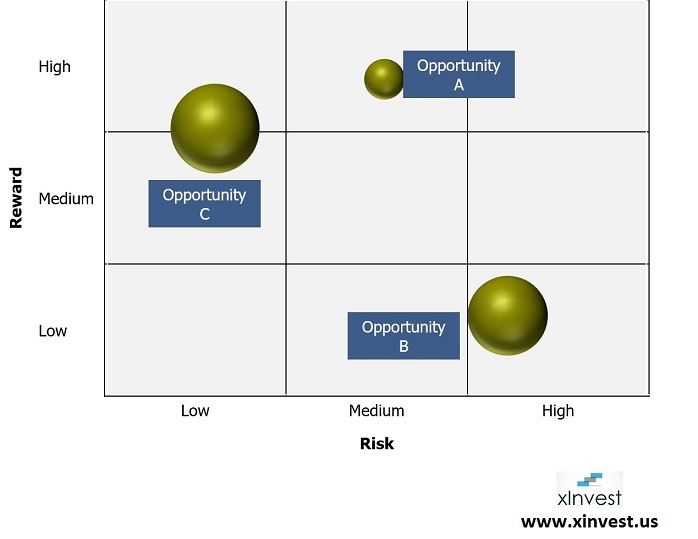 xInvest Consultants: Which business opportunity should we pick? Which business opportunity should we pick? What we have found works really well in screening opportunities out is by looking at three dimensions: size, risk, and reward. It is simple and clever. If you think about it, if the size is attractive enough, the risk is low to moderate, and the reward is medium to high, it is pretty straightforward to see that this is an excellent opportunity to pursue. It can be a new market opportunity or even an acquisition to consider. What if we don't know the exact numbers? Actually, that is a common problem. In fact, even when we do know the numbers, they are merely estimates, or worse, simply guesses. And that's okay. By thinking in terms of ranges and assigning qualitative measures like low/medium/high, you can still make charts like this. What we typically do is to develop some measures. For example, if the client says that if the profit is $25-50 million, they will consider it. In other words, profit below $25 million means that the reward is low and above that is high. And so forth.